In a recent research project supported by the United Nations University Institute for Environment and Human Security (UNU-EHS) and AXA Research Fund, I focused on the main two systems of law in the Pacific — state or national legislation and traditional, customary law — and how the differences between the two could create legal risks when implementing international law associated with climate change, such as the 2015 Paris Agreement. The final policy report, launched in November 2017 at COP23 in Bonn, Germany, produced a set of seven concrete recommendations for policymakers and negotiators when addressing migration and human rights in the context of climate change. Some of the recommendations emphasise the need of an harmonisation between the two legal systems in the Pacific (state/national and traditional) so as to create a single coherent system that can fill in the gaps and help implement international law, such as Paris Agreement. Other recommendations express an acute need for the process of migration to be continuously recognised by the countries in the region and started to be addressed at both technical and political level. However, there are two main conclusions of the research that are applicable on a larger scale, beyond the characteristics of one country or region in particular. The concept of hybrid international law, as developed since 2007, refers to environmental law, human rights, and refugee or migration law. It demonstrates an interrelation between the three, and shows that climate change cannot be addressed without referring to human rights or migration – as direct or subsidiary effects. Today, based on a reciprocal cause-effect relationship, we can’t address environmental degradation — including climate change — without taking into account human rights and/or migration. This analysis applies to all environmental degradation events and disasters, regardless of whether the process is slow (such as sea-level rise, salinisation, etc.) or rapid (flooding, extreme storms, etc.). 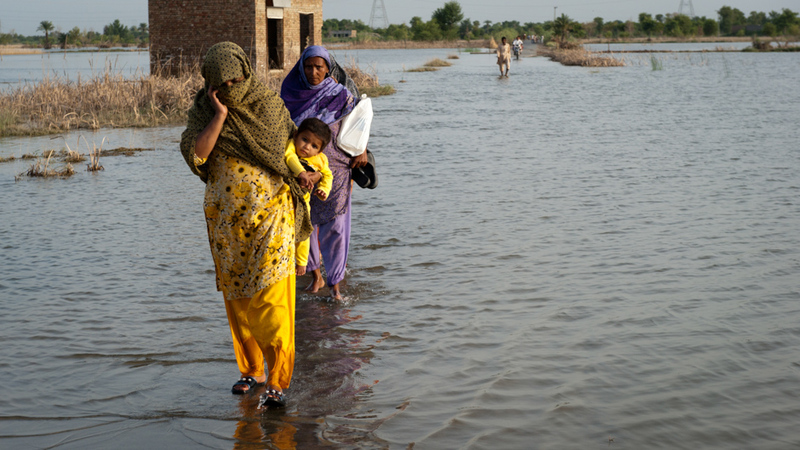 For example, the immediate consequence of a flood could be human rights violations in the affected community — children could be unable from going to school (the right to education), elderly people may be unable to reach medical facilities (the right to health care), and so on. Immediately after the human rights violation (happening at state level due to its obligation to protect and ensure the access to different rights), decisions are usually made by families and individuals depending on the severity of the event: either to stay (adapt) or to flee (migrate). Research in my book Legal Protection of the Sinking Islands Refugees (2016) shows that almost 30% of the people worldwide decide to migrate, mostly due to the limited capacity of states to assist in the adaptation process. The decision to migrate is not exclusively based on environmental reasoning. It can include limitations to human rights access as well economic issues. Most importantly, migration may itself lead to human rights violations, including the right to a clean and healthy environment and ultimately contribute to environmental degradation and climate change. This interlinked and interconnected view of environmental degradation, human rights and (forced) migration represents a change of paradigm, a concrete conceptualisation of the states’ duty to protect or common but differentiated responsibility application for both sending and receiving communities. Reflected also in the decision of the households to migrate or adapt — or use of migration as an adaptive tool when affected by environmental degradation — this nexus enlarges any state’s immediate actions, including as the duty to rescue, to a medium-to long-term approach, which is much more complex. Another core finding is that the regional approach, in general proves more effective when developing, initiating and eventually implementing a migration policy. In September 2016, the UN General Assembly discussed issues related to migration and refugees. In adopting the “New York Declaration for Refugees and Migrants”, the 193 UN member states recognised the need for a comprehensive approach to human mobility and enhanced cooperation at global level. The Global Compact for Migration is framed consistent with target 10.7 of the 2030 Agenda for Sustainable Development in which member states committed to cooperate internationally to facilitate safe, orderly and regular migration and its scope is defined in Annex II of the New York Declaration. However, it is clear that the actual migration process at UN level has unfortunately become quite political and, moreover, parties are not eager to address climate-related mobility. Although the number of climate migrants is rising every year and there are no global policies to respond, member states are very reluctant to recognise climate change as a threat. While the Paris Agreement created a sense of political momentum, the actual process has lost its shine and interest of some parties, even as they all continue to face concrete migration struggles around the world. However, there are previous regional experiences that proven to be more effective than global ones such as environmental (bi- and multi-lateral) agreements with a greater impact in domestic legislation and a better reflection of the priorities countries find to be important in those particular cases. In general, regional documents have an important characteristic that is significantly lost in global agreements, conventions or any other legal forms, and that is represented by identity. Regions have common and distinctive cultural, social and even legal individualities. These spring from communities and define the countries in an idiosyncratic manner, and can include common historical ties, traditions, social structures or cultural and religious manifestations that are better preserved and protected at regional level than globally. In relation to the environment, regions do have specific approaches that are quite difficult to be conserved in global negotiations, but much easier at regional level, as it is very probable to be shared between countries and even define an entire region. States not only have to address present migration humanitarian crises, but they also must regulate and enable future mobility impacts due to environmental-rights breaches. Human mobility is a positive process that has taken place for more than 2,000 years, and because of significant environmental challenges and continuous presence of conflict, it will continue to increase in the future. States should not be surprised by the increasing number of migrants, but instead start regulating mobility taking into account environmental components with a strong rights-based approach, in a preventive mode to assure that basic rights are respected, including that to a clean environment, migrants rights, and human rights. Dr. Cosmin Corendea (S.J.D./GGU) works as Associate Academic Officer/Legal Expert at the UNU Institute for Environment and Human Security (UNU-EHS) in Bonn, Germany. He is acting as focal point for legal issues associated with environmental degradation and adverse effects of climate change, such as institutional vulnerabilities and adaptation, climate equity, climate justice, human rights, and human mobility. Are Countries Legally Required to Protect Their Citizens from Climate Change?